Since prehistoric days man has used a dog to help him track animals for food. With Greek and Roman tribes moving northwards with their prized hunting dogs and settling in Gaul (modern day France), the sport of venery, or hunting with hounds, became firmly associated with that country. 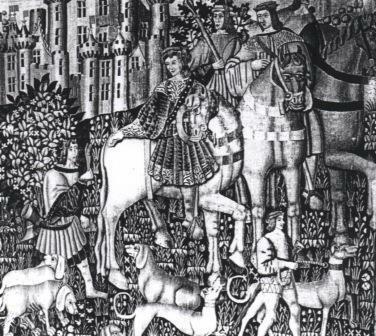 History records that Royalty and noblemen were enthusiastic huntsmen and that, through the Middle Ages, hunting remained the Sport of Kings. Riding to hounds reached a peak in the 17th and 18th centuries and, during that time, huntsmen bred hounds for a specific purpose, with large, powerful ones being used for large game. However there is also evidence of the emergence of a shorter-legged hound. In his 1561 work La Venerie (The Art of Hunting) Jaques du Fouilloux described a type of hound with short legs and strong, low body. It is widely believed this and the woodcuts illustrating the shorter-legged dogs were the first ever reference to the "basset" (â€œbasâ€ = low, so â€œlow setâ€. This hound was further classified by coat varieties - smooth-coat, rough-coat, and half-rough/half-smooth. Degree of crook was also important. 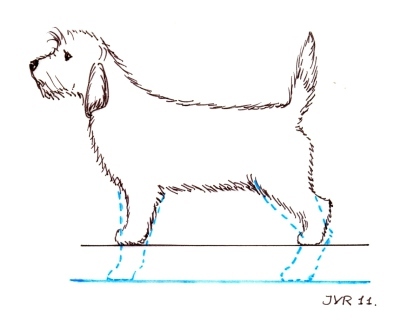 In general the crooked-legged (à jambes torses) bassets were shorted-coated, whereas the straight-legged (à jambes droites) or ones with slight crook (à jambes demi-torses) - were mostly rough-coated, forerunners of Bassets Griffons. 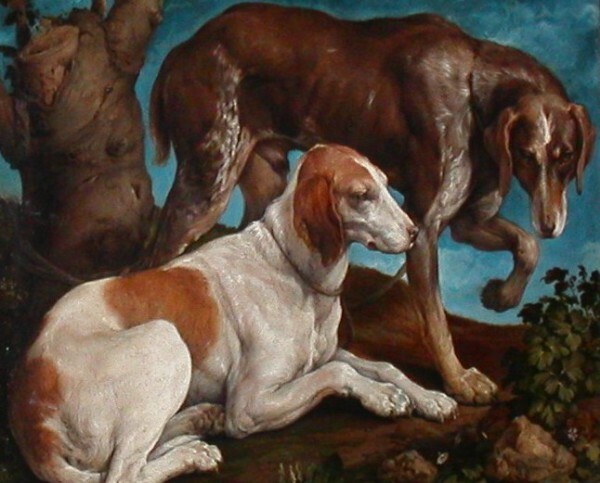 There is additional evidence that shorter-legged hounds existed as far back as the 16th and 17th centuries. The ChÃ¢teau of Langeais on the banks of the Loire was built in 1645 by Louis XI to defend against possible attacks from the Dukes of Brittany. A ChÃ¢teau tapestry depicts basset type, long-eared hounds. Many variations of the Basset were said to have existed in France during pre-Revolutionary days, some say as many as twelve. Sadly, the social upheaval of the 1789-1799 French Revolution brought about the downfall of the aristocracy, with their packs being disbanded. However, faithful servants managed to preserve a few specimens. These poorer huntsmen, who followed the hunt on foot, realised that a slower hound was more suitable for smaller game and the best way to restrict speed was to shorten length of leg. Indeeed, even the gentry included at least several Bassets in their kennel for those occasions when they preferred setting out on foot rather than on horseback after hare, rabbit and other small game. Many of the straight-legged Grand Chien (large dog) French scent-hounds have a basset (low to the ground) version. One school of thought is that when, by freak of nature, the first basset-sized hounds appeared in normal Grand Chien litters, breeders realised that, by breeding basset to basset, this type of hunting hound would be invaluable. And so they were bred for hunting by nose, either with ears sweeping low on the ground to catch the rising scent, or for their ability to get through thick undergrowth where longer-legged hounds found difficulty. 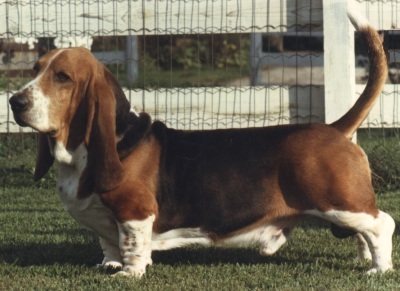 It follows that a basset ("bas" is French for low, so "low to the ground" breed) must be longer than his height, otherwise he would not be a basset. To enable him to hunt, he has to be constructed properly and that means being well balanced, which aids endurance and efficiency when working - and a balanced hound is a stylish one both standing and moving. The Basset Artésien Normand has not been seen on UK soil since the late 1950s and the Basset Bleu de Gascogne remains on the UK Kennel Club Imported Breed Register. It is therefore restricted to being exhibited in Import Register classes at shows. 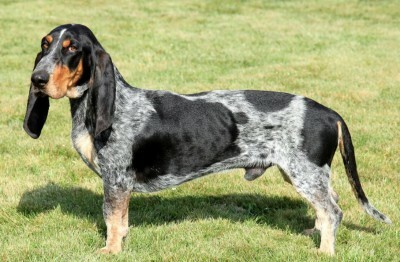 Thus there are four breeds belonging to the basset family currently recognised by the KC. These are the Basset, Basset Griffon Vendéen (Petit), Basset Griffon Vendéen (Grand) and Basset Fauve de Bretagne. But what makes these breeds similar and to what extent do they differ? Of the six, three are the smooth-coated variety, with somewhat looser skin. This will not tear or become damaged easily by thorns or twigs in undergrowth. The others are rough-coated and their longer coat serves a similar purpose, being resistant to brambles and thorns. Each breed has a Standard to which the ideal dog aspires. Although the words may differ slightly from one country to another and the varying Standards are silent on some aspects, they all give the impression of a strong, hardy hound. Characteristics All are scent hounds. They therefore need a good nose and each Standard indicates that the breeds need to be strong, hardy and have great endurance. 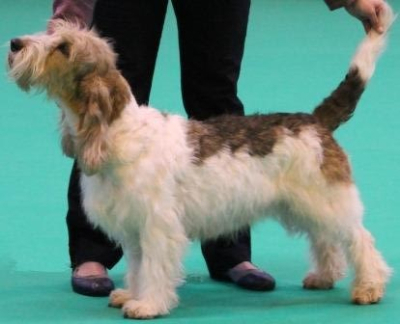 When on the scent, the PBGV and GBGV have a "good voice" purposefully and freely used, the Basset, Artésien Normand and Bleu de Gascogne a melodious or sonorous voice. The Fauve standard omits mention of voice, possibly because they are notorious for their somewhat high pitched, less musical tones. Temperament The smooth coated breeds are well known for being affectionate. The PBGV, GBGV and Fauve bear similar traits of being happy, friendly, extrovert and lively . Similarities In keeping with the principles of good architectural design, body and head structure of a hound must take into account the specific needs for the job he has to perform. 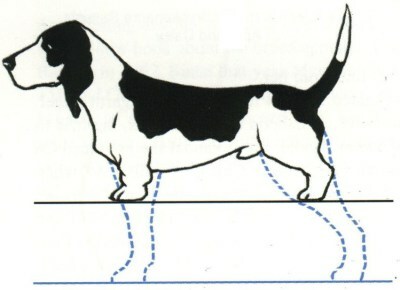 When considering the body of the basset as a whole, certain points are fairly common to all six breeds: - balanced; strong and capable of persevering; wide nostrils; dark eyes (also hazel in Fauves, brown in Bassets Bleu); ears set on level or below the line of the eye and folding inwards. A scissor bite; well defined occiput; shoulders clean and sloping (only slightly in the Fauve); chest deep with prominent sternum; ribs moderately / well rounded and carried well back, with strong loin. Well boned forelegs; muscular hindquarters; tight and well padded feet; tail thick at base and tapering regularly; free movement with front reaching well forward and with good, noticeable, effortless and steady drive behind (the Fauve striding out well with a quick step). General Differences The height range of the six breeds varies a little from the lower height of 30-36cms for the Artésien Normand and 30-38cms for the Basset Bleu de Gascogne, then the Basset Fauve de Bretagne which should be 32-38cm. The stockier Basset has a lower height range of 33cm with upper at 38cm, whereas the Basset Griffon Vendéen (Petit) ranges from 34-38cm. 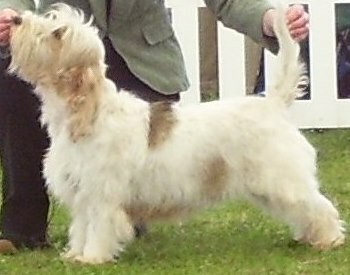 A seemingly larger breed, the Basset Griffon Vendéen (Grand), with its ancestry in the much taller Grand Griffon Vendéen, has a height range of 39-44cms. 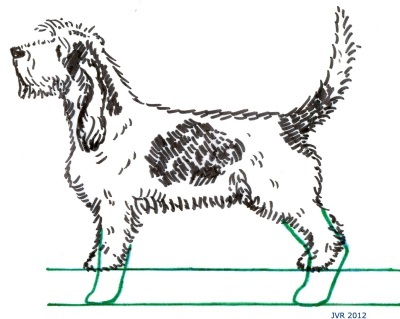 With a tolerance of 1cm in height for examples of some breeds deemed excellent in all other respects, a PBGV at the top end of the height range may be the same height as a GBGV at the lower end of its height range. However there are marked differences between the two breeds which aid distinction. 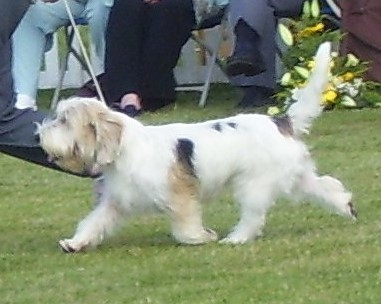 The Basset, PBGV and GBGV are generally tri-colour, white and orange or white and lemon - with grizzle markings often seen in the BGVs. Fauves are distinctive by their fawn, gold or red-wheaten colouring, with the occasional white spot on the chest. Although tri or bi-colour, the Artésien Normand's typical bi-colouring is of fawn and white. The Bleu de Gascogne is characterised by black marked on a white base but covered entirely with black mottling which gives a blue appearance.